experienced 35-year old Cameroonian ex-international center Gaston Essengue (203-109kg-83, college: UNLV) left Quilmes Mar del Plata (La Liga). In 12 games in Argentina he had 8.7ppg, 4.7rpg and 1.0apg this season. 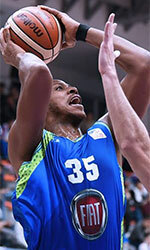 Essengue also played for Club Deportes Puente Alto (Liga Nacional) in Chilean league where in 12 La Liga games he recorded 11.5ppg, 6.6rpg and 1.1apg. He won Argentinian TNA championship title in 2017. Essengue also represented Cameroon at the Afrobasket Championships in Rades (Tunisia) four years ago. His stats at that event were 4 games: 2.5ppg, 2.3rpg. Essengue is quite experienced player. His career allowed him to visit four different continents, while he played in seven different countries. Essengue tasted the life as pro basketball player in Europe, Asia, Latin America and of course North America. He has played previously professionally also in France, Holland, Malaysia (Farmcochem), Spain (Monzon), Switzerland and Turkey and Argentina (Estudiantes Olavarria, Libertad Sunchales, Ciclista, San Martin Marcos Juarez and San Isidro). Essengue attended University of Nevada - Las Vegas until 2007 and it is his twelfth (!!!) season as a professional player.